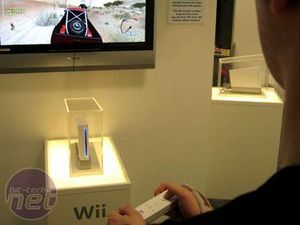 Herein lies part of the problem I have with the Wii. Is it all going to end up as just a novelty? Before you lambaste me with fanboy induced rage hear me out. The pictures on the previous page were carefully selected. At the top you saw the Nintendo produced images, pictures of models enjoying themselves, frolicking around or looking like they are intensely embroiled in a game. Below are pictures of 'real' people, looking overweight, disjointed and ungainly – we're still having fun, albeit of the ugly and humiliating kind. So what does this really mean? I see it as most comparable to playing charades at Christmas. We've all been in the situation, it's the holiday season and the family is round. Everybody has had a few drinks and someone suggest playing charades. The game quickly degenerates into ridiculousness, everybody having a great time, until finally your Uncle Fred is tasked with miming the 'Full Monty' and ends up collapsed and naked, sprawled like Da Vinci's Vitruvian Man in the middle of the living room floor. 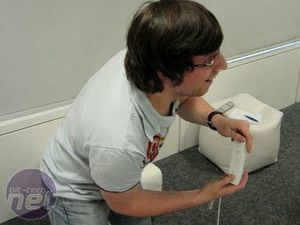 The point I am trying to make is we're all happy to embarrass ourselves on special occasions, doing silly things and getting naked - but can Nintendo really convince us to do it on a day to day basis (not the naked part)? I have my concerns. 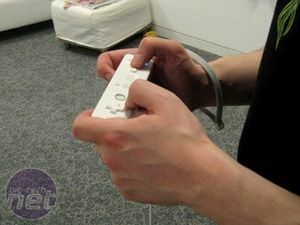 Spending some extra time with the Wii controller I began to get a feeling for how it all actually works. Sitting down to the fishing mini-game in Zelda: Twilight Princess (see over for more detail on all the games) I started out by swinging my arm in the air to try and cast my rod over the furthest distance. It seemed to me to be the most natural way to use the remote, swing it high and fast and I'd do a long cast, yet my lure didn't seem to be going very far. Bemused I flicked my wrist almost accidentally and, oh my word, the lure flew through the air almost out of the lake. 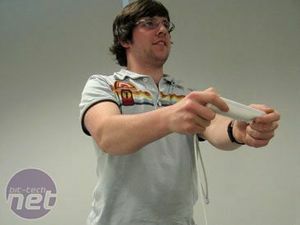 What I had discovered is that as much as we all want the Wii remote to actually work as if it was a magic wand, the actuality is that it has been designed to mimic a joypad, with a few neat tricks thrown in. When I was swordfighting in Zelda for instance, I wanted to be able to hack and slash in a way that felt natural. The actuality is that it is easier to sit down, and instead of hacking and slashing, flicking your wrist in one way or another. 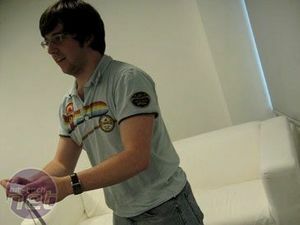 The wrist flicks correspond to what button presses would have done in years gone by and so ultimately you end up with a game that is not drastically different to what you're used to (except you do wrist flicks instead of button bashing). 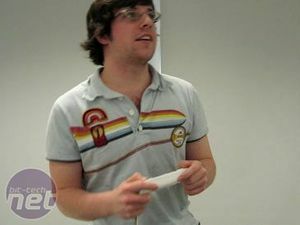 This isn't necessarily the worst thing in the world but it did take away some of the sparkle of the Wii. I wanted something different, something complete unique that really deserved the name revolution. Instead what I found was immensely fun to play though in actuality felt a bit like a mouse, light gun and joypad rolled into one wireless package. This package works brilliantly well with fun games, like WarioWare but had me reverting to joypad techniques and tactics when playing more serious games like Zelda. This could be you come Christmas time. Looking silly and alarmingly, a little podgy.